Integrin–ligand interactions between germinal center (GC) B cells and Ag-presenting follicular dendritic cells (FDCs) have been suggested to play central roles during GC responses, but their in vivo requirement has not been directly tested. In this study, we show that, whereas integrins αLβ2 and α4β1 are highly expressed and functional on mouse GC B cells, removal of single integrins or their ligands had little effect on B cell participation in the GC response. Combined β2 integrin deficiency and α4 integrin blockade also did not affect the GC response against a particulate Ag. However, the combined integrin deficiency did cause B cells to be outcompeted in splenic GC responses against a soluble protein Ag and in mesenteric lymph node GC responses against gut-derived Ags. Similar findings were made for β2-deficient B cells in mice lacking VCAM1 on FDCs. The reduced fitness of the GC B cells did not appear to be due to decreased Ag acquisition, proliferation rates, or pAKT levels. In summary, our findings provide evidence that αLβ2 and α4β1 play overlapping and context-dependent roles in supporting interactions with FDCs that can augment the fitness of responding GC B cells. We also find that mouse GC B cells upregulate αvβ3 and adhere to vitronectin and milk-fat globule epidermal growth factor VIII protein. Integrin β3-deficient B cells contributed in a slightly exaggerated manner to GC responses, suggesting this integrin has a regulatory function in GC B cells. Several in vitro studies over the last 25 years have highlighted the ability of germinal center (GC) B cells to undergo integrin αLβ2 (LFA1)- and α4β1-mediated adhesive interactions with follicular dendritic cells (FDCs) (1–5). αLβ2 and α4β1 on the GC B cell bind cell adhesion molecules ICAM1 and VCAM1, respectively, that are upregulated on GC FDCs (5, 6). Mucosal addressin cell adhesion molecule 1 (MADCAM1), a ligand for both of the α4-containing integrins, α4β7 and α4β1, has also been detected on FDCs (4). As well as promoting cell–cell adhesion, both β1- and β2-containing integrins are able to mediate outside-in signaling in cells via tyrosine kinases, PI3Ks, and small G proteins (7–9). In short-term tissue culture, B cells that are associated with FDCs show enhanced survival, and this trophic effect is reduced when α4β1 and αLβ2 integrin function is blocked (3, 10–13). Integrins have been shown to increase cell viability in a number of contexts (7), and this can occur via activation of AKT-dependent prosurvival pathways (9), but whether integrin signaling is required for GC B cell survival in vivo has not been directly examined. In mice in which inhibitor of κB kinase β (IKK2) was ablated from FDCs, there was a loss of ICAM1 and VCAM1 expression and GC responses were diminished (14). However, this study could not rule out important roles for additional IKK2-dependent molecules in FDCs. Another study associated lower ICAM1 induction on FDCs under conditions of TLR4 blockade with a reduced GC response, but again the conclusion was correlative as TLR4 signaling influences many cell types (15). GC B cells must efficiently acquire, process, and present Ag to receive positive selection signals from T follicular helper cells (16, 17). Much of the Ag present in GCs is displayed on the surface of FDCs in the light zone (6, 18). In vitro studies have shown for non-GC B cells that acquisition of surface-bound Ags from lipid bilayers can be augmented by αLβ2– and α4β1–ligand interactions (19–21). Whether such interactions are important for Ag capture by GC B cells in vivo has not been determined. In addition to cell adhesion molecules, a second group of integrin ligands are the extracellular matrix components. Although the GC is relatively devoid of collagens, laminin and fibronectin, studies in human tissue show the GC light zone contains the 70-kDa glycoprotein vitronectin (VN) (6). VN binds a number of integrins, including αvβ3 (22). Another secreted protein that is abundant in GCs is milk-fat globule epidermal growth factor VIII (MFGE8), a phosphatidylserine-binding protein that promotes clearance of apoptotic cells by engaging αvβ3 on macrophages (23, 24). MFGE8 is made by FDCs (25), and deficiency in MFGE8 is associated with development of lupus-like autoantibodies (26). However, whether GC B cells undergo integrin-mediated interactions with MFGE8 is unknown. In this study, we report that neutralization of β2- and α4-containing integrin function has varying impacts on GC B cells depending on the type of response being mounted. During the polyclonal response to SRBCs, cells without β2 and α4 integrin function were able to participate efficiently in the GC response, indicating that these integrins are not universally required for Ag capture or GC B cell survival. Importantly, however, during the response of B cells to a soluble protein Ag, β2 and α4 integrin deficiency compromised participation in the GC. This compromise did not involve obvious effects on affinity maturation, cell turnover, or induction of pAKT, suggesting that integrin-mediated adhesion to FDCs augments GC B cell fitness through additional pathways. We also find that GC B cells express elevated levels of αvβ3 integrin and bind both VN and MFGE8, ligands that are abundant within the GC. C57BL/6 and C57BL/6 CD45.1+ mice were from the National Cancer Institute or Jackson ImmunoResearch Laboratories. Integrin Itgb2−/− mice (27) were backcrossed to C57BL/6J for six generations. Hy10 mice with knock-in expression of Ig specific for hen egg lysozyme were from an internal colony (28). Mice expressing the CD21Cre transgene (B6.Tg[Cr2-Cre]3Cgn) (29) were from K. Rajewsky (CBR Institute for Biomedical Research and Harvard Medical School). Itgb1fl/fl mice (30), VCAM1fl/fl mice (31), and Itgb3−/− mice (32) were from Jackson ImmunoResearch Laboratories (004605, 007665, and 008819, respectively). Animals were housed in a specific pathogen-free environment in the Laboratory Animal Research Center at the University of California San Francisco, and all experiments conformed to ethical principles and guidelines approved by the Institutional Animal Care and Use Committee of the University of California San Francisco. Bone marrow (BM) chimeras were generated by mixing equal amounts of the indicated BM types and injecting 2–5 × 106 BM cells into lethally irradiated recipients, as described (33). Mice were reconstituted for 6–12 wk before immunization or analysis. SRBC immunizations were i.p. with 2 × 108 cells (Colorado Serum). For adoptive transfers, 5 × 104 each of integrin Itgb2+/− (CD45.1/2 GFP+, CD45.1/2+, or CD45.1+) and Itgb2−/− (CD45.2+GFP+, CD45.1+, or CD45.1/2+) Hy10 B cells were transferred into CD45.2+ hosts together with 5 × 104 OT-II T cells. To avoid rejection issues, all the hosts used as transfer recipients were C57BL/6J wild-type or VCAM1fl/fl CD21Cre mice that had been lethally irradiated and reconstituted with 90% C57BL/6J and 10% integrin Itgb2+/+ BM cells in which the latter were from Itgb2+/− intercrossed mice. The ratio of Itgb2−/− and Itgb2+/− Hy10 B cells in control GCs varied between experiments, probably because of slight inaccuracies in cell counts in the input mixtures. Due to the low number of B cells transferred, it was not possible to determine the ratio of engrafted Itgb2−/− and Itgb2+/− Hy10 B cells in the follicular compartment. Mice were immunized i.p. with 50 μg duck egg lysozyme (DEL)-OVA in the Sigma-Aldrich adjuvant system. Some of the mice were i.v. injected with 200 μg integrin α4 Ab (PS/2; Bio X Cell) or MADCAM1 Ab (MECA367; Bio X Cell) at the indicated time. Some of the mice were also injected with 50 μg anti–DEC205-OVA together with anti-α4, as indicated. The Eα-GFP construct was provided by M. Jenkins (University of Minnesota), and the protein was produced, chemically conjugated to hen egg lysozyme (HEL), and purified, as described (34). Mice were immunized i.v. with 20 μg HEL-Eα-GFP 4 h prior to analysis. Spleen and lymph nodes (LNs) were isolated and mashed into media containing 2% FCS. For analysis of GC B cells, cells were stained with anti-B220 (RA3-6B2; BD Biosciences or BioLegend); anti-CD19 (6D5; BD Biosciences); anti-Fas (Jo2; BD Biosciences); anti-IgD (11-26c.2a; BD Biosciences or BioLegend); anti-CD45.1 (A20; BD Biosciences or BioLegend); anti-CD45.2 (104; BD Biosciences or BioLegend); anti-IgG2b (RMG2b-1; BD Biosciences); homemade Alexa647-conjugated DEL; Ab to T cell and B cell activation Ag (GL7; BD Biosciences); anti-mouse Eα52–68 peptide bound to I-Ab (Y-Ae; eBioscience); anti-integrin β1 (MB1.2; Chemicon); anti-integrin β2 (C71/16; BD Biosciences); anti-integrin β3 (2C9.G2; BioLegend); anti-integrin β7 (M293; BD Biosciences); anti-integrin α4 (PS/2; Bio X Cell); anti-integrin αL (M17/4; Bio X Cell); anti-integrin αV (RMV-7; BD Biosciences); rat IgG2a isotype control (2A3; Bio X Cell); rat IgG2b isotype control (LTF-2; Bio X Cell); or rat IgG1 isotype control (R3-34; BD Biosciences). BrdU staining was done using BrdU flow kit (BD Biosciences) following manufacturer's instructions. For intracellular staining of phosphorylated AKT at Ser473 (pAKT), cells were instantly fixed and stained, as described (35). Anti-pAKT (9271; Cell Signaling Technology) was used. Cryosections 7 μm in thickness were cut and fixed in cold acetone. Sections were stained with anit-ICAM1 (3E2; BD Biosciences); anti-VCAM1 (429; BD Biosciences); anti-MADCAM1 (MECA367; Bio X Cell); anti-IgD (11-26c.2a; BioLegend); anti-VN (347317; R&D Systems); rat IgG2a isotype control (2A3; Bio X Cell); or anti-CD35 (8C12; BD Biosciences), using described protocols (36). Adhesion assay was done, as described (37). Plates were coated with 10 μg/ml ICAM1, VCAM1, MADCAM1, VN, or MFGE8. VN was from Abcam. All of the other reagents were from R&D Systems. Statistical analysis was performed using two-tailed Student t tests. By flow cytometric analysis, splenic GC B cells had elevated αL and β2 integrin expression compared with follicular B cells (Fig. 1A). Integrin β1 levels were slightly elevated, whereas β7 was reduced (Fig. 1A), suggesting GC B cells shift from a mixture of α4β1 and α4β7 heterodimers to predominantly expressing α4β1. Immunofluorescence analysis of serial sections from SRBC-immunized spleens showed abundant expression of ICAM1, VCAM1, and MADCAM1 on the GC FDC network (Fig. 1B), as expected (4, 38, 39). In a static adhesion assay, GC B cells adhered more strongly than follicular B cells to ICAM1 (Fig. 1C), consistent with the higher expression of αLβ2 in GC B cells. Both cell types adhered strongly to VCAM1 and weakly to MADCAM1 (Fig. 1C). α4β1, α4β7, and αLβ2 integrin and ligand expression in the GC. (A) C57BL/6 mice were immunized with SRBCs, and on day 8 expression of integrins on B220+IgD+Fas− follicular B cells (FoB) and B220+IgD−Fas+GL7+ GC B cells (GCB) was analyzed by flow cytometry with chain-specific Abs (ItgAb). (B) Serial sections of a SRBC-immunized spleen stained with the indicated integrin ligand Abs (red), CD35 (green), and IgD (blue). Scale bar, 100 μm. Data in (A) and (B) are representative of more than three mice. (C) Splenocytes from SRBC-immunized mice were allowed to adhere to plastic coated with ICAM1, VCAM1, or MADCAM1 and adherent subsets enumerated by flow cytometry. Data are shown as percentage of input cells that remained adherent and are representative of at least two experiments. To test whether β1 integrin-mediated interaction with FDC-expressed VCAM1 was important during the GC response, we generated mixed chimeras by reconstituting irradiated wild-type mice with Itgb1f/f or Itgb1f/+ Mb1Cre+ CD45.2+ BM and wild-type CD45.1/2+ BM. Eight days following SRBC immunization, there was an underrepresentation of CD45.2+ GC B cells compared with follicular B cells in both groups that most likely reflects the impact of Mb1 heterozygosity in the Mb1Cre+ cells (40). However, there was no significant reduction in GC representation of the Itgb1−/− B cells compared with their heterozygote controls (Fig. 2B). We confirmed that there was efficient ablation of integrin β1 from Itgb1f/f Mb1Cre+ GC B cells (Fig. 2B). A similar mixed BM chimera analysis using Itgb2−/− and littermate control donors showed that this integrin was also not essential for B cell participation in the GC response (Fig. 2C). To test for possible redundancy between αLβ2 and α4β1 integrins in GC B cells, we induced GCs in Itgb2−/−:wild-type mixed BM chimeras and then treated them with anti-α4 blocking Ab from days 7 to 14 after SRBC immunization. Analysis of GC B cells at the time of isolation confirmed that their α4 integrins were saturated with the Ab (Fig. 2D). Even under these conditions, in which αLβ2, α4β1, and α4b7 integrins are absent or blocked from binding FDC-expressed ICAM1, VCAM1, and MADCAM1, we observed no impact on B cell participation in the SRBC-induced GC response (Fig. 2D). β1 and β2 integrin-deficient B cells mount intact GC response to SRBCs. (A) Flow cytometric gating strategy to identify GC and follicular B cells in mixed BM chimeric mice. (B) Flow cytometry of mixed wild-type (CD45.1/2+) and Itgb1fl/+Mb1cre+ or Itgb1fl/flMb1cre+ (CD45.2+) BM chimeras, immunized i.p. with SRBCs 8 d before analysis. Contribution of CD45.2+ cells to follicular and GC B cells was plotted. Each dot represents one mouse. Bottom panel, Integrin β1 staining of GC B cells from Itgb1fl/+Mb1cre+ and Itgb1fl/flMb1cre+ mice. (C) Contribution of CD45.2+ integrin Itgb2+/− or Itgb2−/− cells to follicular and GC B cells in mixed integrin Itgb2+/− or Itgb2−/− plus wild-type (WT, CD45.1/2+) BM chimeras, immunized i.p. with SRBCs 8 d before analysis. Each dot represents one mouse. Data in (B) and (C) were pooled from two independent experiments. (D) Mixed integrin Itgb2−/− (CD45.2+) plus wild-type (WT, CD45.1/2+) BM chimeras were immunized i.p. with SRBCs, treated with control (PBS or isotype control) or integrin α4 Ab every other day from day 7 after immunization, and analyzed on day 14. Contribution of CD45.2+ cells to follicular and GC B cells was plotted. Right panel, GC B cells from α4 Ab-injected mice were stained with anti-rat secondary Ab alone (α4 i.v. + 2nd), α4 Ab plus anti-rat secondary Ab (α4 i.v. + 1st + 2nd), or an isotype control Ab and anti-rat secondary (Ctrl + 2nd). Each dot represents one mouse. Data are representative of three independent experiments. We considered it likely that the contribution of integrins to the GC response may vary depending on the form of Ag. To test whether integrin function is required during the response to a soluble protein Ag, we intercrossed lysozyme-specific IgH knock-in and L chain transgenic (Hy10) mice (28) to the Itgb2−/− background. B cells from these mice were cotransferred with congenically marked wild-type Hy10 B cells and wild-type OTII T cells to syngeneic recipients that were then immunized with a conjugate of DEL and OVA (OVA; DEL-OVA) in monophosphoryl lipid A–based adjuvant (28). In a first experiment, the impact of α4 integrin blockade during the early phase of the response was tested. Treating with Ab on days 1, 3, and 5, followed by analysis on day 7, showed the GC response was unaffected by α4–Ab treatment (Fig. 3B). These data suggested that β2 and α4 integrin function on B cells was not crucial for entry into the GC response against a soluble Ag. We next tested the impact of blocking integrin function during the GC response. Transfers were performed as before, and mice were left untreated until day 7; they were then treated with α4-neutralizing Ab on days 7, 9, 11, and 13, or only on day 12, and analyzed on day 14. Under these conditions, the β2-deficient GC B cells were underrepresented compared with the WT GC B cells. This effect was more striking with the longer period of treatment (Fig. 3C). Role of integrins αLβ2 and α4β1 in the GC response against soluble Ag. (A) Schematic diagram of experimental procedures used for (B) and (C). Wild-type mice were adoptively transferred with congenically marked lysozyme-specific integrin Itgb2+/− and Itgb2−/− Hy10 B cells plus OVA-specific OT-II T cells, immunized with DEL-OVA, and treated with Abs, as indicated. (B) Mice were treated with saline (Ctrl) or α4 blocking Ab from day 1 for every other day and analyzed on day 7. Ratio of integrin Itgb2−/− (KO) versus Itgb2+/− (Het) Hy10 GC B cells was plotted. Each dot represents one mouse. Data were pooled from two independent experiments. (C) Mice were treated with saline (Ctrl) or α4 blocking Ab from day 7 or 12 for every other day and analyzed on day 14. Data are representative of at least three experiments (*p < 0.05, ***p < 0.001). The ratio of Itgb2−/− and Itgb2+/− Hy10 B cells in control GCs varied between experiments, most likely because of slight inaccuracies in cell counts in the input mixtures. (D) VCAM1 staining of sections from VCAM1fl/fl CD21cre− or VCAM1fl/fl CD21cre+ mice that were transferred with Hy10 B cells plus OT-II T cells and DEL-OVA immunized 14 d before. Scale bar, 100 μm. (E) Transfers were performed as in (A), except, rather than wild-type mice, VCAM1fl/fl CD21cre+ mice were used as hosts. Some of the mice were further treated with MADCAM1 blocking Ab from day 7 for every other day. Analysis was on day 14. Data are representative of at least three independent experiments (***p < 0.001). (F) Flow cytometric analysis of GC light and dark zone cells from mice in (E). Frequency of CD86+CXCR4low light zone cells was plotted. Data are representative of at least two independent experiments. 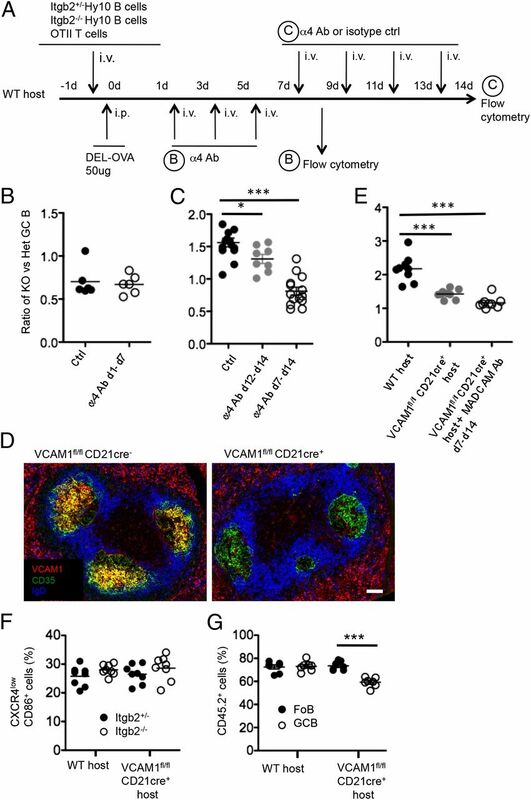 (G) Flow cytometry of mesenteric LNs from wild-type or VCAM1fl/fl CD21cre+ mice reconstituted with mixed wild-type (CD45.1/2+) and integrin Itgb2−/− (CD45.2+) BM (ratio ∼25:75). Each dot represents one mouse. Data were pooled from two independent experiments (***p < 0.001). To confirm that the α4-blocking Ab was acting by inhibiting GC B cell interaction with FDC-expressed VCAM1, we generated mice lacking VCAM1 on FDCs by intercrossing VCAM1f/f mice (31) with CD21cre mice (14). Immunofluorescence analysis confirmed the efficient and selective ablation of VCAM1 from the FDC networks (Fig. 3D). Using these mice as recipients for transferred Itgb2−/− Hy10 B cells showed that, compared with littermate control hosts, there was a significant reduction in GC participation on day 14 (Fig. 3E). Additionally, blocking MADCAM1 by treatment with a neutralizing Ab had only a mild effect in further reducing the response. Because the integrin ligands are most abundant in the GC light zone, we examined whether the proportion of light zone GC B cells was affected by β2 integrin and VCAM1 deficiency. Analysis of the fraction of GC B cells with a light zone (CXCR4lowCD86high) phenotype showed comparable frequencies for integrin function-deficient and control cells (Fig. 3F). We attempted to perform experiments to confirm that the B cell β2 integrin requirement was for interaction with FDC-expressed ICAM1 by using as recipients chimeric ICAM1−/− mice that had been reconstituted with wild-type BM. However, in the course of these experiments, we observed that ICAM1−/− mice retained measurable ICAM1 on FDCs, most likely due to alternative splicing around the targeted exon (exon 4) (41) prohibiting us from performing this analysis. Finally, we asked whether the endogenous GC response that takes place in mesenteric LNs against commensal flora-derived Ags was influenced by integrin deficiency. Analysis of Itgb2−/−:wild-type mixed BM chimeras 8–12 wk after reconstitution showed that β2 deficiency alone had no effect on GC participation, but, when combined with VCAM1 deficiency from FDCs, the β2-deficient GC B cells became underrepresented (Fig. 3G). In summary, these data provide in vivo evidence that GC B cell participation in the splenic response against a soluble Ag and in the mucosal response against gut-derived Ags is augmented by αLβ2 and α4β1 integrin-mediated interactions with ligands in the GC, including VCAM1 and most likely ICAM1 on FDCs. To test the hypothesis that GC B cell–integrin–mediated adhesion promotes Ag capture and presentation to T cells and thus selection of high-affinity cells, we used the Hy10 B cell transfer system and examined the cells for improved binding of the DEL immunogen (16) (Fig. 4A). Surprisingly, even though the cells were being outcompeted from the GC, the cells that remained had an equivalent improvement in DEL binding by day 14 of the response to that occurring in the wild-type controls (Fig. 4A). They also exhibited normal extents of isotype switching to the favored isotype for this response, IgG2b (Fig. 4A). Despite the lack of evidence for a defect in affinity maturation, it seemed possible that the integrin-deficient cells were capturing less Ag and being outcompeted due to insufficient T cell help (16, 17). To test this possibility, we treated mice with DEC205-OVA to target a surplus of Ag to the B cells irrespective of the efficiency of Ag encounter via the BCR (42). The DEC205-OVA Ab was effective at delivering Ag in vivo, as demonstrated by its ability to promote a vigorous OVA-specific CD8 (OT-1) T cell response (Fig. 4B). However, even when the cells were provided with this surplus Ag, there was no measurable rescue of Itgb2−/− cell participation in the GC response (Fig. 4B). As an approach to test the efficiency of Ag acquisition, mice were injected with HEL-Eα-GFP at the peak of the GC response and then examined for the amount of GFP capture and Eα-peptide display, the latter being detected using the I-Ab-Eα–specific Ab Y-Ae (34). When analyzed 4 h after HEL-Eα-GFP injection, Itgb2−/− and control Hy10 B cells showed equivalent amounts of Ag capture and MHC class II–peptide display (Fig. 4C). 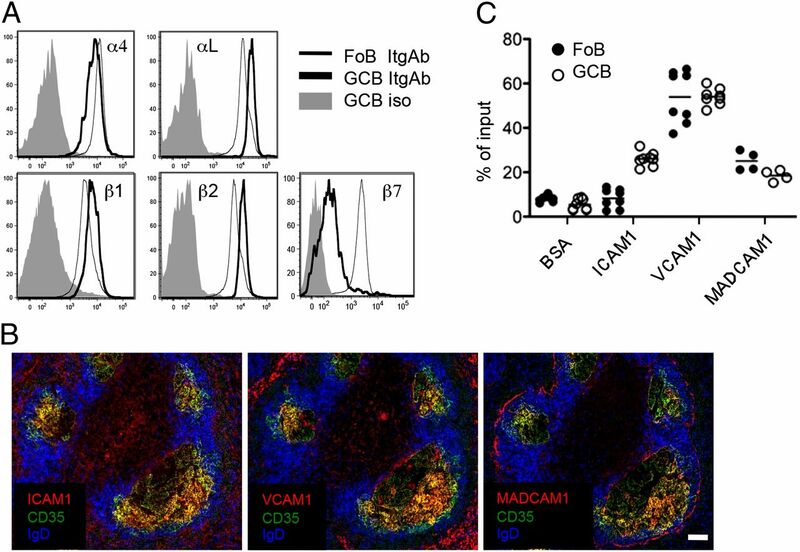 BrdU-labeling experiments showed the integrin-deficient GC B cells were proliferating at a comparable rate to control cells in the same animals as well as in matched control chimeras (Fig. 4D). Finally, we examined pAKT levels in GC B cells using a procedure in which the cells are fixed with paraformaldehyde during isolation in an attempt to maintain their signaling molecules in the same status as within the GC (35). Signaling via β2- and β1-containing integrins has been reported to increase pAKT levels in cells directly (43, 44) or by augmenting BCR signaling (9, 45). GC B cells had elevated pAKT levels, as determined by comparison with cells treated with calf intestinal phosphatase that serve as a background control. However, integrin-deficient GC B cells did not show any alteration in pAKT levels compared with the matched control cells (Fig. 4E). Integrin-deficient GC B cell Ag acquisition, affinity maturation, and turnover. (A) Integrin β2+/− and β2−/− Hy10 B cells plus OT-II T cells were transferred into wild-type or VCAMfl/fl CD21cre+ mice, which were then immunized i.p. with DEL-OVA. At day 7 or 14, splenic GCB cells were stained for class switch to IgG2b and affinity maturation (DEL-binding). Mice analyzed at day 7 had no measurable affinity maturation. Plots are gated on transferred B cells, and numbers indicate percentage of cells in each quadrant. Graphs on right show percentage of DEL-binding or IgG2b+ cells on day 14. Data are representative of at least three independent experiments. (B) Wild-type mice were adoptively transferred with integrin Itgb2+/− and Itgb2−/− Hy10 B cells plus OT-II T cells, immunized with DEL-OVA, treated with α4 Ab or α4 Ab plus anti-DEC205-OVA (50 μg) from day 7 for every other day, and analyzed on day 14. Each dot represents one mouse. Data are representative of two independent experiments. Right plots show frequency of OVA-specific OT-1 CD8 T cells in spleens of recipient mice 3 d after injection of saline (Ctrl) or anti-DEC205 OVA (300 ng). (C) Mice of the type in (A) were injected with 20 μg HEL-Eα-GFP or HEL-BSA on day 14. Four hours later, they were analyzed for GC B cell GFP level and Eα peptide display using Y-Ae Ab. Data are representative of two independent experiments. (D) Mice of the type in (B) were injected with 2 mg Brdu on day 14 and analyzed 30 min later for Brdu incorporation by GC B cells. Data are representative of three independent experiments. (E) Cells of the type in (B) were fixed at the time of isolation, left untreated, or treated with calf intestinal phosphatase (CIP) and stained for intracellular pAKT. Data are representative of three independent experiments. By genome-wide gene expression analysis, mouse GC and follicular B cells were found to have a 2- to 3-fold increase in Itgb3 transcripts and a slight increase in Itgav transcripts (www.Immgen.org and data not shown). Flow cytometric analysis confirmed that both β3 and αv integrin chains are upregulated on GC versus follicular B cells (Fig. 5A). The secreted proteins VN and MFGE8 are ligands for αvβ3 (22, 23). VN expression has been reported in human GCs but has not been studied in the mouse (46–49). Analysis of mouse spleen and mesenteric LN tissue sections demonstrated that VN expression is a conserved property of the GC light zone (Fig. 5B). Using static adhesion assays, GC B cells adhered strongly to VN and less strongly to MFGE8, whereas follicular B cells showed only weak adhesion to VN (Fig. 5C). 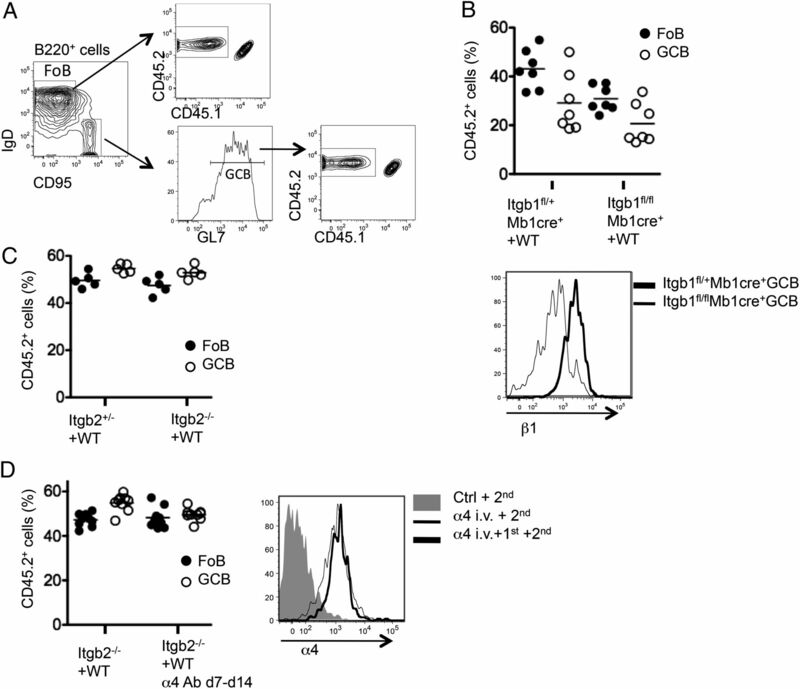 Adhesion of GC B cells to both VN and MFGE8 was β3 dependent (Fig. 5C). To test whether αvβ3 played a role in B cells during the GC response, mixed Itgb3−/−:wild-type BM chimeras were generated and immunized with SRBCs. This analysis revealed that, compared with their representation in the follicular compartment, Itgb3−/− cells were slightly overrepresented in the splenic GC compartment (Fig. 5D). This was also seen for the chronic GC responses within mesenteric LNs that are induced by commensal flora (Fig. 5D). Finally, we asked whether the response to soluble protein Ag was affected. Itgb3−/− Hy10 B cells and control Hy10 B cell and OTII T cells were transferred to syngeneic recipients, and the mice were analyzed 14 d after immunization with DEL-OVA in monophosphoryl lipid A–based adjuvant. Under these immunization conditions, there was no impact of β3 integrin deficiency on Hy10 B cell participation in the splenic GC response (Fig. 5E). These data suggest that distinct integrin–ligand interactions can have quite different influences on the GC response. Integrin αvβ3 expression and function in GC B cells. (A) C57BL/6 mice were immunized with SRBCs and after 8 d examined for expression of integrin αvβ3 on follicular and GC B cells by flow cytometry. Itgb3−/− mice or isotype-matched Abs were used as staining controls. Data are representative of two independent experiments. (B) Spleen and mesenteric sections from a SRBC-immunized mouse were stained with anti-VN or isotype-matched control. Scale bar, 100 μm. Data are representative of tissue from more than three mice. (C) Splenocytes from SRBC-immunized mice were allowed to adhere to plastic coated with ICAM1, VN, or MFGE8, and adherent follicular and GC B cells were enumerated by flow cytometry. (D) Flow cytometry of mixed BM chimeras generated with integrin Itgb3+/− or Itgb3−/− (CD45.2+) cells plus wild-type (CD45.1+) cells, reconstituted for at least 6 wk and immunized i.p. with SRBCs 10–12 d before analysis. Data were pooled from three independent experiments and are representative of several additional experiments that involved >20 mice (*p < 0.05, ***p < 0.001). (E) Wild-type mice were adoptively transferred with lysozyme-specific integrin Itgb3+/− or Itgb3−/− Hy10 B cells plus OT-II T cells, immunized with DEL-OVA, and analyzed on day 14. Data are representative of two independent experiments. Based on a series of in vitro studies, the concept emerged that αLβ2 and α4β1 integrins play an essential role in GC responses. Their role was thought to include provision of necessary trophic signals and augmentation of Ag capture. Our findings above contrast with the simplest version of this model by showing that B cells lacking αLβ2 and α4β1 function continue to be able to mount GC responses against a particulate Ag. However, these integrins did participate in the GC B cell response against a soluble protein Ag and undefined gut-derived Ags. During the protein Ag response, we were not able to observe defects in Ag acquisition, cell turnover rate, or pAKT levels in the integrin-deficient cells. These data suggest that integrin-mediated adhesion to FDCs augments GC B cell fitness through additional pathways that are still to be defined. Finally, we found that GC B cells express functional αvβ3, and we show that VN is a conserved component of the GC light zone. β3 integrin deficiency had a mild augmenting effect on the GC response to particulate and commensal Ags. Taken together, our findings suggest a highly contextual involvement of integrin–ligand interactions in the GC response, with their contributions most likely depending heavily on the type of Ag driving the response and the amounts and types of costimulatory inputs available. Following from an early study that showed GC B cell lines could adhere to GCs on sections in an α4β1–VCAM1–dependent manner (1), several in vitro experiments showed α4β1- and αLβ2-mediated adhesion between isolated FDCs and B cells (3, 10, 11, 13). Blocking these adhesive interactions led to reduced survival of the isolated B cells (3, 10, 11, 13). In contrast to these observations, our studies show in vivo that αLβ2 and α4β1 are not essential for GC B cell survival. An explanation for this discrepancy most likely lies in the greater availability of trophic factors in vivo than are provided in the in vitro cultures. In addition, whereas integrin–ligand interactions are probably essential for the B cells to maintain any association with isolated FDCs in a tissue culture dish, this may not be the case in the animal. In the intact tissue, there are many cues promoting GC B cell clustering around FDCs. For example, sphingosine-1-phosphate (S1P) receptor 2 responding to a repulsive gradient of S1P promotes GC B cell clustering over the FDC network (50). When GC B cells lack S1P receptor 2, they are less well confined to the GC (50). Analysis of tissue sections from mice harboring integrin-deficient GC B cells did not show any major alteration in GC B cell distribution (data not shown). The importance of FDCs in promoting GC B cell viability in vivo is supported by the finding that diphtheria toxin–mediated ablation of FDCs leads to rapid death of GC B cells (36). The inability of IKK2-deficient FDCs to support GC responses might reflect both a lack of adhesion molecule expression and reduced production of trophic factors or cues that promote GC B cell clustering. α4β1 and αLβ2 integrin-mediated adhesion can greatly augment the ability of follicular B cells in vitro to acquire Ag by promoting spreading and contraction of the cell membrane over lipid bilayers in a manner that facilitates greater contact between the BCR and membrane-associated Ag (19, 51, 52). Given these convincing data, we were surprised that our studies did not readily reveal defects in Ag acquisition by integrin-deficient GC B cells. We suspect that there are a number of explanations for this apparent discrepancy. First, the forms of Ag tested in the lipid bilayer studies and in our in vivo studies are not identical. For example, it is likely that the Ags injected in vivo become associated with activated fragments of complement, leading to recruitment of complement receptors 1 and 2 on the B cell. These are strong costimulatory receptors (53) that can also augment Ag capture (54). Second, the properties of the FDC membrane may facilitate B cell capture of certain types of Ag as aggregates or in vesicular (“iccosome”) structures (55), and this capture may not be enhanced by integrin-mediated membrane spreading and contraction. Third, GC B cells are highly motile in vivo and they exhibit a large, probing morphology (28, 56, 57). Findings by us (58) and others (59) have shown that naive lymphocytes and dendritic cells do not require integrin-mediated adhesion for motility in lymphoid tissues. Therefore, the integrin-mediated spreading and contraction functions revealed in vitro may be redundant with other cell biological mechanisms acting in vivo to promote large areas of membrane contact as GC B cells migrate over and squeeze between the tightly interconnected network of FDC processes. That said, integrins can augment T cell motility over dendritic cells in the T zone (60), and it remains possible that less efficient movement of integrin-deficient GC B cells over FDCs contributes to their reduced fitness. In future studies, it will be important to visualize the migration dynamics of integrin-deficient GC B cells within the GC. Our finding that integrin αvβ3 is upregulated on the surface of GC B cells and is functional in vitro in mediating adhesion highlights a further layer of complexity in dissecting the integrin–ligand contribution to GC responses. One ligand for αvβ3, MFGE8, is a well-defined marker of the GC FDC network, and it plays a role in promoting apoptotic cell uptake by tingible body macrophages (25). We show that a second ligand, VN, is present in the light zone of mouse GCs, consistent with findings for human GCs (46–49). VN is a RGD-containing secreted protein that has a variety of binding partners, including complement C5b-9, plasminogen activator inhibitor-1, and heparin sulfate proteoglycans (61). Whether VN is produced locally in the GC light zone by FDCs or arrives from circulation, where it is abundant, is not yet clear. Beyond a possible role in the GC as an αvβ3 ligand, VN may act to help limit membrane damage by inhibiting terminal cytolytic complement pathway activity (61). αvβ3 can also bind the RGD-containing proteins fibronectin, fibrinogen, von Willebrand’s factor, thrombospondin, and osteopontin (22). GCs contain detectable fibronectin (J.G. Cyster, unpublished observations), but whether any of the additional αvβ3 ligands are present is not yet defined. Although the αvβ3 ligands are secreted rather than membrane proteins, it is possible that they function in an overlapping manner with other integrins by promoting motility and spreading of GC B cells. In this regard, it is notable that, based on in vitro studies with fibroblasts and epithelial cells, VN is also known as “cell-spreading factor” (22). It is also interesting to consider whether αvβ3 on GC B cells may have a role in sensing MFGE8 during Ag uptake. Recent studies in dendritic cells have shown that MFGE8 directs internalized apoptotic material to lysosomes, and, when it is absent, apoptotic Ag is less rapidly destroyed and more efficiently presented (62, 63). Perhaps by targeting phosphatidylserine-bearing Ags internalized via the BCR for rapid lysosomal degradation, MFGE8-αvβ3 antagonizes Ag presentation to T follicular helper cells. The slightly augmented GC participation of β3-deficient B cells is consistent with such a negative regulatory role. 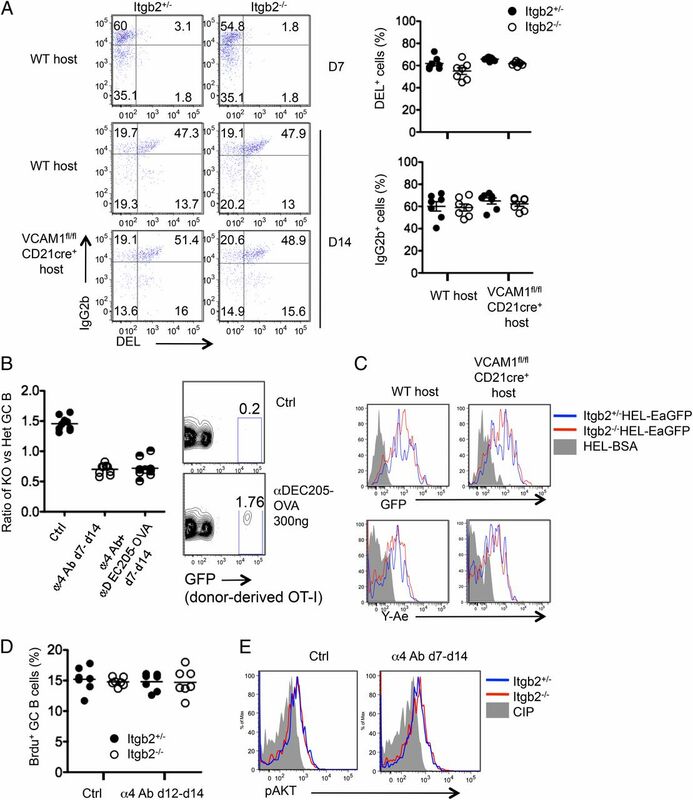 It will be valuable in future studies to determine whether β3 integrin deficiency in B cells predisposes to production of anti-apoptotic cell autoantibodies. There is also evidence that, in contrast to most integrins, αvβ3 can transmit proapoptotic signals depending on the extent of ligand engagement (64–68). Thus, the slight overgrowth of β3-deficient GC B cells observed in our studies might be a consequence of losing an integrin-mediated negative regulatory signal, a possibility that merits future investigation. As well as the integrins studied in this work, GC B cells have been reported to upregulate the α6 chain (69). This integrin chain can pair with β1 and β4, and its induction may account for the elevated β1 but slight reduction in α4 staining observed by flow cytometry (this study) (69). GC B cells express little or no β4 chain (69) (J.G. Cyster, unpublished observations). α6β1 is a laminin-binding integrin (70). In the studies reported to date, laminin is sparse within the GC but can be abundant at the GC perimeter (71) (our unpublished data), suggesting that if α6β1 is functional in GC B cells, it may have a distinct role regarding the other integrins in which the ligands are most abundant in association with the FDC network. However, there are multiple forms of laminin (70), and it remains possible that some forms are present in the GC light zone, possibly adding further redundancy to the integrin–ligand interactions in this region. Arguing against α4β1 being redundant with other β1-containing integrins in GC B cells, mice lacking Itgb1 from all hematopoietic cells mounted normal GC responses against a haptenated protein Ag (72). These mice did mount a diminished IgM plasma cell response, but the authors commented that the IgM defect could not be rescued by transfers of wild-type B cells, suggesting that it was due to a role of β1-containing integrins in other hematopoietic cell types. In summary, our findings provide evidence that integrins αLβ2 and α4β1 play overlapping and context-dependent roles in supporting interactions with FDCs that can augment the fitness of responding GC B cells. The mechanism by which they enhance GC B cell fitness is not yet clear. Our currently favored model is that they contribute small and difficult-to-measure influences on a range of processes, including access to trophic factors, certain forms of Ag, and differentiation factors. That their contribution may often be redundant with contributions by other ligand–receptor systems, possibly including additional integrins, is consistent with the view that the strong evolutionary pressure for mounting GC responses established a highly robust biological system (16). We thank Michel Nussenzweig for anti–DEC205-OVA plasmid, Jagan Muppidi for help with pAKT staining, Jinping An for mouse husbandry and screening, and Tangsheng Yi for helpful discussion. This work was supported by National Institutes of Health Grant AI45073. X.W. is an associate and J.G.C. an investigator of the Howard Hughes Medical Institute.
. 1990. 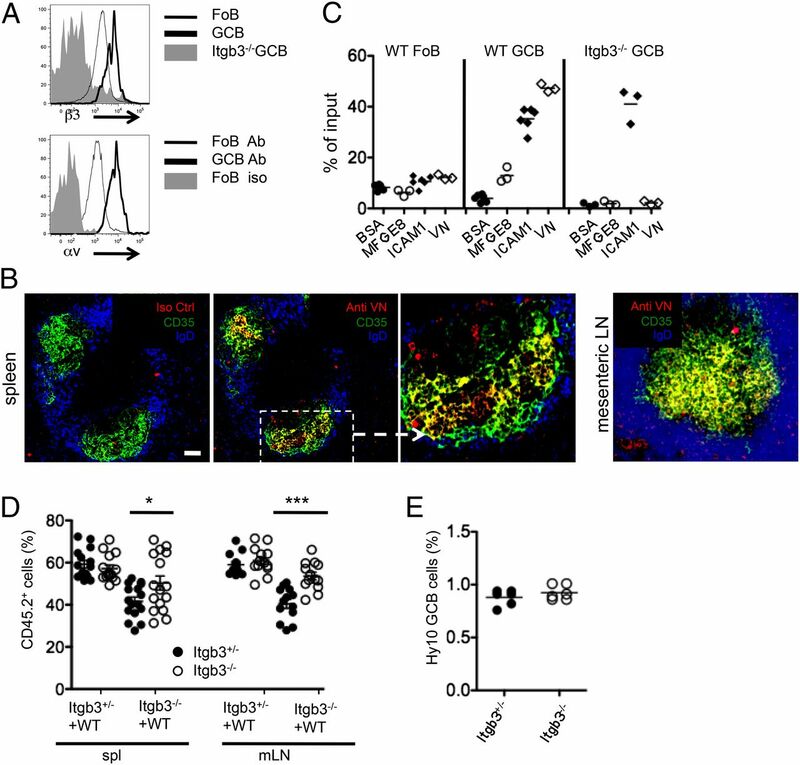 Adhesion of human B cells to germinal centers in vitro involves VLA-4 and INCAM-110. Science 249: 1030–1033.
. 1992. Follicular dendritic cell-dependent adhesion and proliferation of B cells in vitro. J. Immunol. 148: 2331–2339.
. 1994. Adhesion through the LFA-1 (CD11a/CD18)-ICAM-1 (CD54) and the VLA-4 (CD49d)-VCAM-1 (CD106) pathways prevents apoptosis of germinal center B cells. J. Immunol. 152: 3760–3767.
. 1997. Specialization of mucosal follicular dendritic cells revealed by mucosal addressin-cell adhesion molecule-1 display. J. Immunol. 158: 5584–5588.
. 1997. Follicular dendritic cells and presentation of antigen and costimulatory signals to B cells. Immunol. Rev. 156: 39–52.
. 2008. Follicular dendritic cell networks of primary follicles and germinal centers: phenotype and function. Semin. Immunol. 20: 14–25.
. 1999. Integrin signaling. Science 285: 1028–1032.
. 2011. The insider’s guide to leukocyte integrin signalling and function. Nat. Rev. Immunol. 11: 416–426.
. 2010. Control systems and decision making for antibody production. Nat. Immunol. 11: 681–688.
. 1993. Direct evidence that human follicular dendritic cells (FDC) rescue germinal centre B cells from death by apoptosis. Clin. Exp. Immunol. 91: 330–336.
. 1997. Germinal center B cells rescued from apoptosis by CD40 ligation or attachment to follicular dendritic cells, but not by engagement of surface immunoglobulin or adhesion receptors, become resistant to CD95-induced apoptosis. Eur. J. Immunol. 27: 1–7.
. 2010. Activation of B cells by antigens on follicular dendritic cells. Trends Immunol. 31: 205–211.
. 1991. Adhesion of human B cells to follicular dendritic cells involves both the lymphocyte function-associated antigen 1/intercellular adhesion molecule 1 and very late antigen 4/vascular cell adhesion molecule 1 pathways. J. Exp. Med. 173: 1297–1304.
. 2006. FDC-specific functions of p55TNFR and IKK2 in the development of FDC networks and of antibody responses. Immunity 24: 65–77.
. 2010. Toll-like receptor 4 signaling by follicular dendritic cells is pivotal for germinal center onset and affinity maturation. Immunity 33: 84–95.
. 2012. Germinal centers. Annu. Rev. Immunol. 30: 429–457.
. 1993. Follicular dendritic cells in germinal center reactions. Adv. Exp. Med. Biol. 329: 461–465.
. 2004. LFA-1/ICAM-1 interaction lowers the threshold of B cell activation by facilitating B cell adhesion and synapse formation. Immunity 20: 589–599.
. 2006. B-cell activation by membrane-bound antigens is facilitated by the interaction of VLA-4 with VCAM-1. EMBO J. 25: 889–899.
. 2007. The role of integrins and coreceptors in refining thresholds for B-cell responses. Immunol. Rev. 218: 197–213.
. 1993. Vitronectin and its receptors. Curr. Opin. Cell Biol. 5: 864–868.
. 2002. Identification of a factor that links apoptotic cells to phagocytes. Nature 417: 182–187.
. 2012. Two-step engulfment of apoptotic cells. Mol. Cell. Biol. 32: 118–125.
. 2008. Follicular dendritic cells control engulfment of apoptotic bodies by secreting Mfge8. J. Exp. Med. 205: 1293–1302.
. 2004. Autoimmune disease and impaired uptake of apoptotic cells in MFG-E8-deficient mice. Science 304: 1147–1150.
. 1998. Spontaneous skin ulceration and defective T cell function in CD18 null mice. J. Exp. Med. 188: 119–131.
. 2007. Imaging of germinal center selection events during affinity maturation. Science 315: 528–531.
. 2004. Survival of resting mature B lymphocytes depends on BCR signaling via the Igalpha/beta heterodimer. Cell 117: 787–800.
. 2000. Conditional ablation of beta1 integrin in skin: severe defects in epidermal proliferation, basement membrane formation, and hair follicle invagination. J. Cell Biol. 150: 1149–1160.
. 2001. Conditional vascular cell adhesion molecule 1 deletion in mice: impaired lymphocyte migration to bone marrow. J. Exp. Med. 193: 741–754.
. 1999. Beta3-integrin-deficient mice are a model for Glanzmann thrombasthenia showing placental defects and reduced survival. J. Clin. Invest. 103: 229–238.
. 2007. The humoral immune response is initiated in lymph nodes by B cells that acquire soluble antigen directly in the follicles. Immunity 26: 491–502.
. 2012. B cell receptor signal transduction in the GC is short-circuited by high phosphatase activity. Science 336: 1178–1181.
. 2011. Follicular dendritic cells help establish follicle identity and promote B cell retention in germinal centers. J. Exp. Med. 208: 2497–2510.
. 2002. Integrin-mediated long-term B cell retention in the splenic marginal zone. Science 297: 409–412.
. 2002. Appearance and phenotype of murine follicular dendritic cells expressing VCAM-1. Anat. Rec. 268: 160–168.
. 1995. Expression of the intercellular adhesion molecule-1 on high endothelial venules and on non-lymphoid antigen handling cells: interdigitating cells, antigen transporting cells and follicular dendritic cells. Cell Tissue Res. 279: 47–54.
. 2006. Testing gene function early in the B cell lineage in mb1-cre mice. Proc. Natl. Acad. Sci. USA 103: 13789–13794.
. 2010. Germinal center dynamics revealed by multiphoton microscopy with a photoactivatable fluorescent reporter. Cell 143: 592–605.
. 2004. Signaling through the leukocyte integrin LFA-1 in T cells induces a transient activation of Rac-1 that is regulated by Vav and PI3K/Akt-1. J. Biol. Chem. 279: 16194–16205.
. 2010. PI3-kinase p110α mediates β1 integrin-induced Akt activation and membrane protrusion during cell attachment and initial spreading. Cell. Signal. 22: 1838–1848.
. 2008. The rap GTPases regulate B cell morphology, immune-synapse formation, and signaling by particulate B cell receptor ligands. Immunity 28: 75–87.
. 1996. Morphology, function and pathology of follicular dendritic cells. Pathol. Int. 46: 807–833.
. 1988. Deposits of terminal complement complex and S-protein on follicular dendritic cells in human lymphoid tissue. Adv. Exp. Med. Biol. 237: 185–189.
. 2000. Follicular dendritic cells share a membrane-bound protein with fibroblasts. J. Pathol. 191: 217–226.
. 2001. The poliovirus receptor CD155 mediates cell-to-matrix contacts by specifically binding to vitronectin. Virology 285: 218–227.
. 2011. The sphingosine 1-phosphate receptor S1P2 maintains the homeostasis of germinal center B cells and promotes niche confinement. Nat. Immunol. 12: 672–680.
. 2001. Expression of CCR9 beta-chemokine receptor is modulated in thymocyte differentiation and is selectively maintained in CD8(+) T cells from secondary lymphoid organs. Blood 97: 850–857.
. 2007. B cells acquire particulate antigen in a macrophage-rich area at the boundary between the follicle and the subcapsular sinus of the lymph node. Immunity 27: 160–171.
. 2000. Regulation of B lymphocyte responses to foreign and self-antigens by the CD19/CD21 complex. Annu. Rev. Immunol. 18: 393–422.
. 2009. Visualizing B cell capture of cognate antigen from follicular dendritic cells. J. Exp. Med. 206: 1485–1493.
. 1988. A novel in vivo follicular dendritic cell-dependent iccosome-mediated mechanism for delivery of antigen to antigen-processing cells. J. Immunol. 140: 341–353.
. 2007. In vivo imaging studies shed light on germinal-centre development. Nat. Rev. Immunol. 7: 499–504.
. 2007. Lymph node chemokines promote sustained T lymphocyte motility without triggering stable integrin adhesiveness in the absence of shear forces. Nat. Immunol. 8: 1076–1085.
. 2008. Rapid leukocyte migration by integrin-independent flowing and squeezing. Nature 453: 51–55.
. 2013. Dendritic cells regulate high-speed interstitial T cell migration in the lymph node via LFA-1/ICAM-1. J. Immunol. 191: 1188–1199.
. 2011. Vitronectin in vascular context: facets of a multitalented matricellular protein. Semin. Thromb. Hemost. 37: 408–424.
. 2011. Autoimmunity in MFG-E8-deficient mice is associated with altered trafficking and enhanced cross-presentation of apoptotic cell antigens. J. Clin. Invest. 121: 2221–2241.
. 2012. MFG-E8 regulates the immunogenic potential of dendritic cells primed with necrotic cell-mediated inflammatory signals. PLoS One 7: e39607.
. 2001. Apoptosis of adherent cells by recruitment of caspase-8 to unligated integrins. J. Cell Biol. 155: 459–470.
. 2002. Integrin-mediated death: an explanation of the integrin-knockout phenotype? Nat. Med. 8: 193–194.
. 2002. Enhanced pathological angiogenesis in mice lacking beta3 integrin or beta3 and beta5 integrins. Nat. Med. 8: 27–34.
. 2005. Unoccupied alpha(v)beta3 integrin regulates osteoclast apoptosis by transmitting a positive death signal. Mol. Endocrinol. 19: 771–780.
. 2011. Pro-apoptotic role of integrin β3 in glioma cells. J. Neurochem. 117: 494–503.
. 2004. Alpha6-integrin is expressed on germinal centre B cells and modifies growth of a B-cell line. Immunology 111: 400–406.
. 2008. The extracellular matrix of the spleen as a potential organizer of immune cell compartments. Semin. Immunol. 20: 4–13.
. 1993. The nonlymphoid microenvironment of reactive follicles and lymphomas of follicular origin as defined by immunohistology on paraffin-embedded tissues. Hum. Pathol. 24: 67–76.
. 2002. Beta1 integrin is not essential for hematopoiesis but is necessary for the T cell-dependent IgM antibody response. Immunity 16: 465–477.